We stayed with friends at Keauhou Punahele for one week Big Island Tour. We arrived at the Kona International Airport on a flight from Seattle. After our Big Island Tour, we caught a Hawaiian Airlines flight to Maui. The weather in Keauhou was unbeatable. 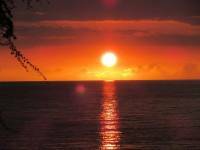 Every morning was sunny in the Kona area. The clouds build over the island in the afternoon and cause an overcast, but the sun always sneaks back through so that you can watch the sun go down. The temperature is basically the same every day. Perfect weather for a light T-shirt, shorts and sandals. Start off with a trip to Kona for coffee on the waterfront, snorkeling at Kahalu’u Bay, chocolate covered macadamia nuts at the ABC store and then back to the condo for a nap. The evenings were perfect room temperature, which meant for an enjoyable walk down to the Sheraton Keauhou nightly to watch the manta rays feed in the waters lit by spotlight from the hotel. The next morning you simply felt like doing it all over again. Kahalu’u Beach Park is a popular spot about 5.5 miles south of Kona on the waterfront Ali’i Drive. The beach has covered picnic tables, washrooms, a concession stand, a sandy beach and outdoor freshwater showers. Snorkel equipment can be rented at the beach. The snorkeling here is excellent. The coral reef is protected by a breakwater and a large assortment of tropical fish can be seen in the shallow waters near shore. 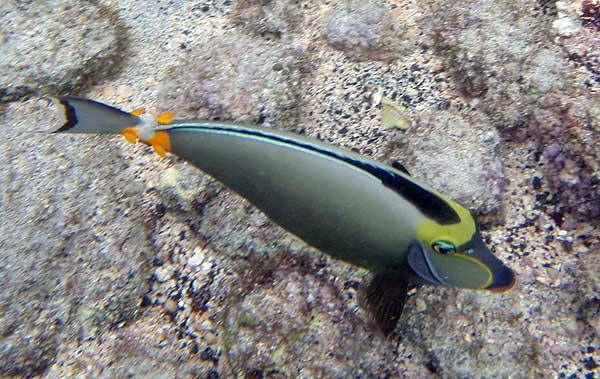 This includes parrotfish, yellow tangs, reef triggers, black triggers, convict tangs, orange spine tangs, unicornfish, coris and butterflyfish. I particularly enjoyed traveling with a school of raccoon butterflyfish. They seemed to want me to join their group. The raccoon butterflyfish were so close that I nearly pushed them aside as I swam. 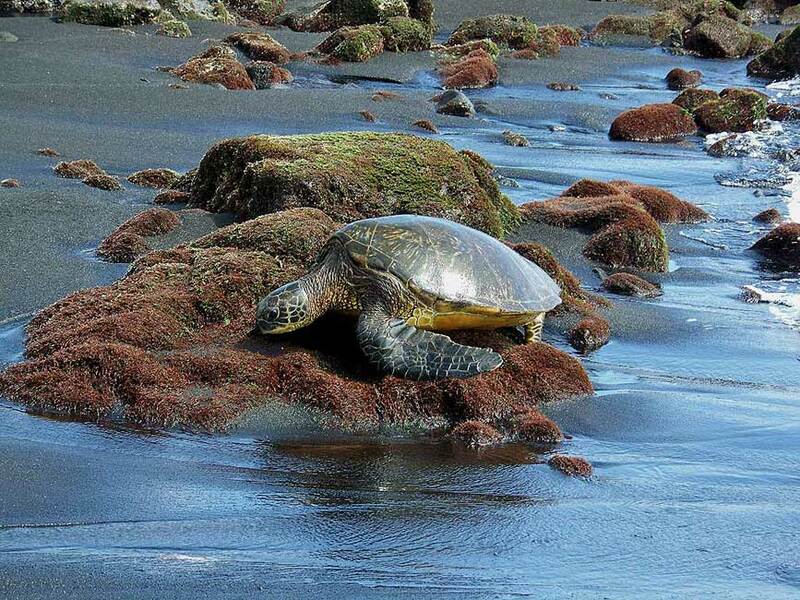 Green sea turtles hang out along the rocky shore here too. In fact one of them came up on the beach daily among all the people to bask in the sun. 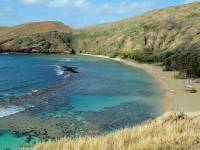 The sea life was much more varied, enjoyable and easily accessible than the highly rated Captain Cook Monument snorkeling at Kealakekua Bay. 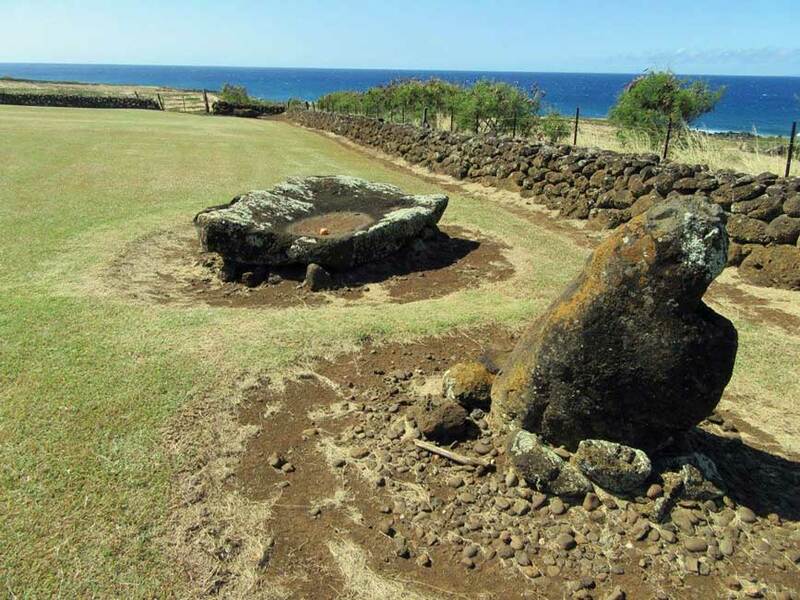 This spot was the favorite part of my Big Island Tour. 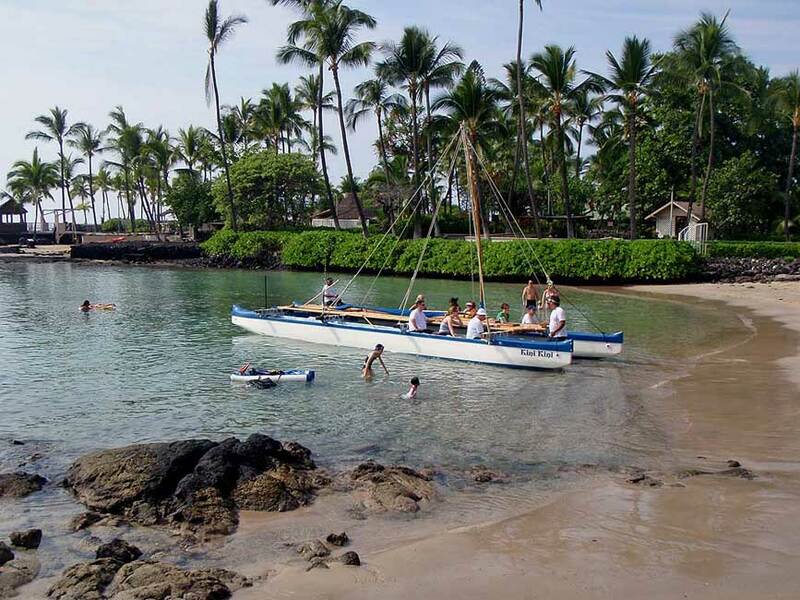 Although the cruise ships call this Kona, you’ll need to use Kailua-Kona to start finding this on the internet. The small beach at the tender pier is a great spot with sandy beach, washrooms and showers. There are also snorkel rentals and everything else you need, like macadamia nut chocolates, at the ABC store across the street. 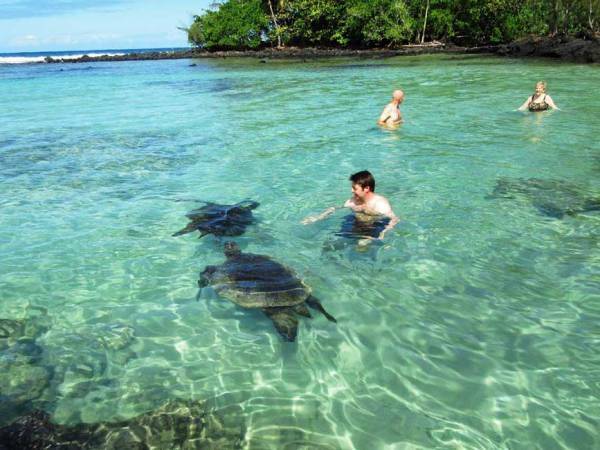 Although the water in this sheltered bay is a little murky, it’s a great spot to view tropical fish. I saw a large school of yellow tangs, bird wrasses, puffers, orange spot tangs, even a long nosed butterfly and lots of gold ring tangs. 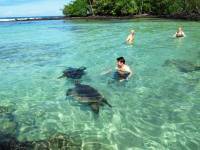 Not the best snorkel, but a fun free addition to a Big Island Tour. 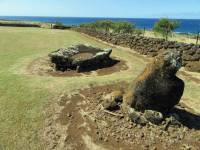 In late January, we extended our Big Island Tour to the south end of the island. At the town site of Na`alehu, we stopped at the Punalu’u Bake Shop for a wide selection of fresh baked goods. They also serve sandwiches made from sweetbread buns and hot meals which were welcome on the return route. The town is the most southerly in the United States and was an extremely clean and lovely spot. Nearby is the Punalu’u Black Sand Beach. The beach is almost entirely soft black volcanic sand. Green sea turtles were the big attraction here though. We could see 5 or 6 at a time just 10 – 15 feet from the shore. My wife was eager to snorkel with them. She soon found herself almost on top of a green sea turtle and she panicked to escape the docile creature. I found it was easier to see the turtles by standing near them in the water and looking down. Eventually one crawled up on the beach, which made a great shot. 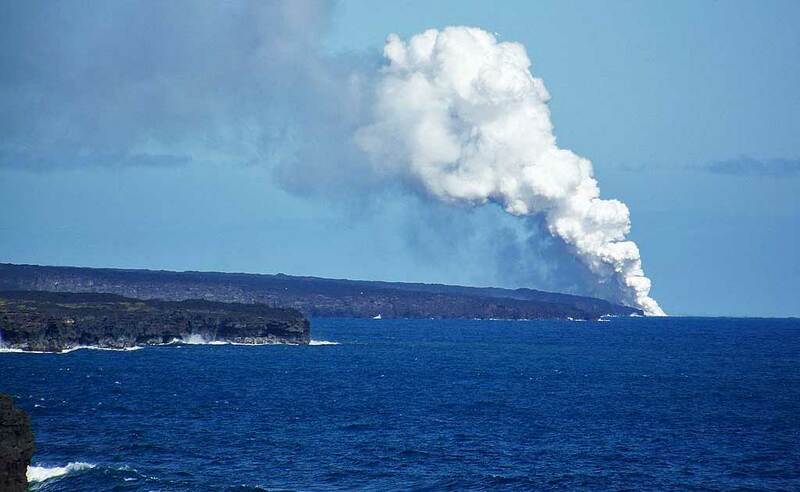 Next my Big Island Tour visit Hawai’i Volcanoes National Park. We headed down from the Kiluea Crater to the Chain of Craters by the sea. Finally seeing the Chain of Craters was a highlight of the visit to the Big Island for me. Descending from the 4,000 foot level, you soon leave the tropical forest which is filled with the sounds of singing birds. A number of very deep craters are soon reached. These were originally pools of lava where the lava subsequently leaked out. 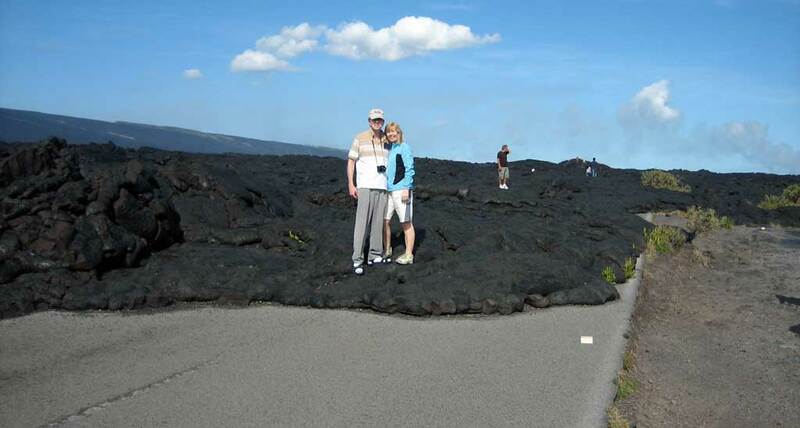 Soon after the craters, you reach large areas of old hardened lava flow. You can actually hike for miles across these and descend to the ocean on foot over it. 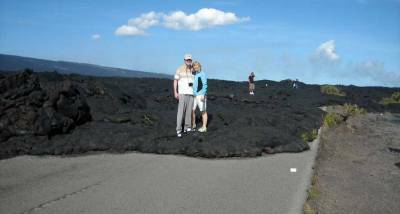 It’s amazing to look down and see the vast expanse of lava that has covered this area through repeated eruptions over the centuries. In the distance, you could see the steam cloud where the lava from Pu’u O’o was currently entering the ocean. 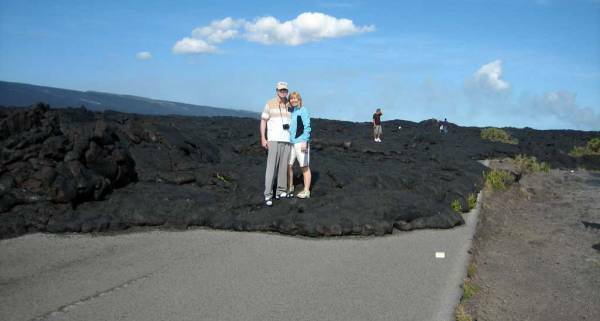 At the end of the road, you could hike a quarter mile to a location where the lava has covered over the original road surface. Truly a remarkable world. Our last excursion on the Big Island Tour was to Mauna Kea. We took the Mauna Kea Summit Adventures tour. It started in Kona on a new 14 passenger bus with large windows and a comfortable ride. The bus stops at Waikaloa to pick up passengers along the way. Then the tour bus headed to the bumpy Saddle Back road, passing through the Parker Ranch and a US military installation on the saddle between Mauna Kea and Mauna Loa. From there the bus turned north and headed up to the 9,000 foot visitor center and scientist dorms. At the visitor center we received an included hot meal, heavy parkas and gloves. After the visitor center stop, the bus climbed the gravel road up to 13,800 foot peak of Mauna Kea. The landscape was eerie, with no vegetation. 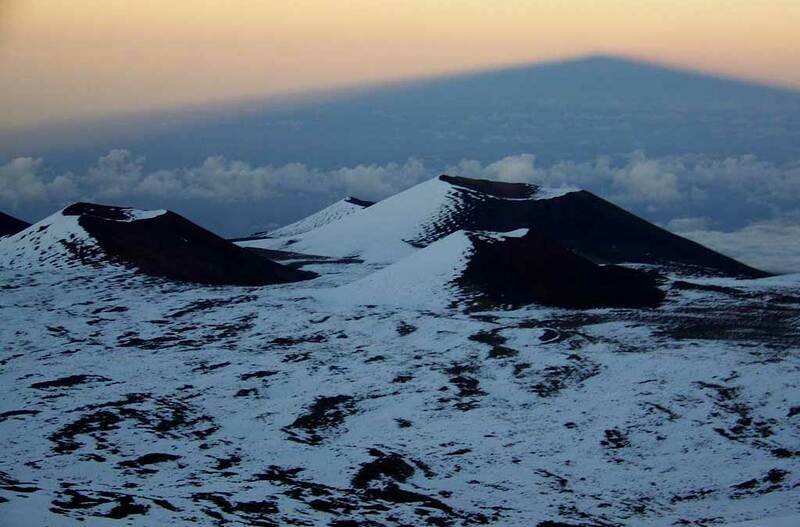 Only volcanic debris and numerous cinder cones could be seen. We watched the sunset in the crispy air. 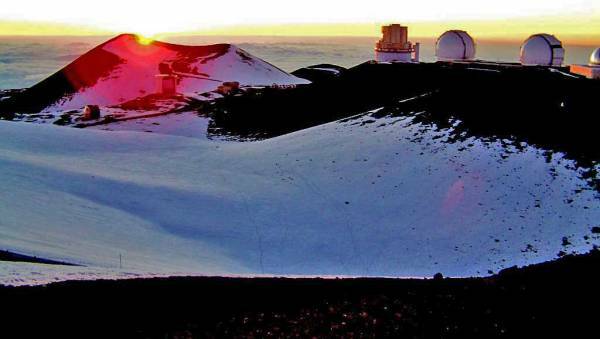 As the sunsets, the various observatories come to life, spinning and opening their doors to begin their nights work. It was surreal. I was reminded of the Time Machine story, where the Morlocks come out of the ground after sunset to gather up humans. As it grew dark, we headed back down near the visitor center to star gaze. Mauna Kea Summit Adventures brought its own 11 inch Celestron CPC telescope. The viewing is excellent at 9,000 feet. We saw tons of stars, a few meteors and several satellites too. Our guide toured us through the night sky, including locating the North Star, the Andromeda galaxy, Perseus, Pegasus, the Devil Star, Orion, Taurus and many of the signs of the zodiac. The highlight for me was the Orion Nebula and the fine detail you could see of the constellation of Orion. The air at 9,000 feet was so thin that the stars overhead did not twinkle, but shone steadily instead. The hot chocolate and shortbread was very welcome and offset the chill in my toes. I can’t say enough about this 9 hour experience. You could never duplicate it off a cruise ship tour, as you would miss the sunset and all the stars. What a great way to end our Big Island Tour.